Stoddard Valley Off-Highway Vehicle OHV Area offers a diverse landscape for off-highway vehicle recreation. The area is characterized by steep rocky mountains, rolling hills, open valleys, and winding sandy washes. Elevations range from 5,000-foot Stoddard Peak, to 2,800 feet at Turtle Valley. Vegetation consists of creosote scrub, some annual grasses and wild flowers and the Joshua tree, symbol of the Mojave Desert. The riding area is triangular-shaped, formed by Interstate 15 and California Highway 247 (Barstow Road), immediately south of Barstow, California. 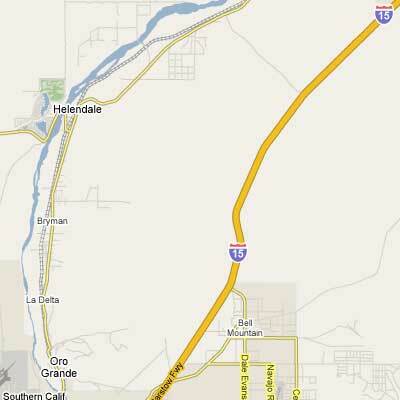 Most visitors access the area to the east, off Interstate-15 at the Outlet Center Drive Exit (Sidewinder Road) or at the Hodge Road Exit, south of there. From California Highway 247 (take Barstow Road Exit from I-15 and go south), 10 miles south of Barstow, turn either on Stoddard Wells Road or on the access road behind the Slash-X Cafe. All of these entrances are dirt roads. General Information: Most of the area visitors ride motorcycles or ATVs, or tour the area in four-wheel drive vehicles. The easily accessed areas off the Sidewinder Road exit are used extensively for OHV free play. The area is also used extensively for competitive racing events by permit. There are many occasions for hiking, rock scrambling, rock hounding, and plant, bird and wildlife watching. There are desert tortoise, a state and federally listed threatened species, within the riding area. NOTE: There are many deep mine shafts in the riding area! Please avoid these areas and camp away from mine shafts!